The European Association for the Study of the Liver (EASL) released its latest hepatitis C treatment guidelines at the 50th International Liver Congress which took place last week in Vienna, Austria. The guidelines recommend a variety of interferon-free direct-acting antiviral (DAA) regimens for people with hepatitis C virus genotypes 1-6. The panel offered recommendations for patient groups that remain difficult to treat, such as those with decompensated cirrhosis, but noted that more research is still needed in several areas. Also concurrent with the conference, EASL and the Latin American Association for the Study of the Liver released joint guidelines for non-invasive assessment of liver disease severity, noting that liver stiffness measurement is becoming the standard of care. 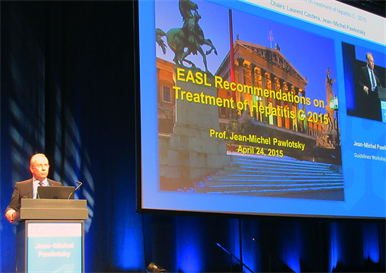 "Virtually everyone infected has a right to be treated for hepatitis C, but we have to acknowledge reality – the new drugs are too expensive and the huge number of patients make it impossible to treat everyone in the next couple years, so we have to prioritise accordingly," said EASL guidelines panel co-ordinator Jean-Michel Pawlotsky. Pawlotsky presented an overview of the updated recommendations at a special session on Friday. Panel members Alessio Aghemo, David Back, Geoffrey Dusheiko, Xavier Forns, Massimo Puoti and Christoph Sarrazin then participated in a discussion of issues raised by the guidelines, joined by Donald Jensen representing the American Association for the Study of Liver Diseases (AASLD). The guidelines, published in the April online edition of the Journal of Hepatology and available on the EASL website, are intended to assist physicians and other healthcare providers, as well as people with hepatitis C and other interested individuals, in clinical decision-making. The new recommendations apply to therapies that have been approved in the European Union, but they are written broadly enough that new drugs can be considered as they become available, EASL Vice Secretary Laurent Castera told the press. Hepatitis C therapy has been a "very rapidly moving field," he said, "but our impression is that the field is stabilising" – with overall SVR rates above 90% – and is now moving to address "niche" populations like people with decompensated cirrhosis, liver transplant recipients, and patients with chronic kidney disease. The goal of hepatitis C treatment is to eradicate HCV infection in order to prevent liver cirrhosis, decompensation, hepatocellular carcinoma (liver cancer) and death, according to the guidelines. Among people with advanced cirrhosis, treatment can reduce the need for liver transplantation. "All treatment-naive and treatment-experienced patients with compensated or decompensated chronic liver disease related to HCV, who are willing to be treated and who have no contraindications to treatment, should be considered for therapy," the guidelines state. However, "because not every HCV-infected patient can be treated within the next year or so, prioritization is necessary." The guidelines assign treatment priority based on liver fibrosis stage, risk of progression, extra-hepatic (outside the liver) manifestations and likelihood of HCV transmission. Treatment is a priority for people with advanced fibrosis or cirrhosis (Metavir stage F3-F4), including people with decompensated cirrhosis, who stand to benefit greatly from treatment. But people with very advanced liver disease – Child-Pugh-Turcotte scores above 12 or MELD scores above 20 – may not benefit as much. Other high-priority groups include people with HIV or hepatitis B virus (HBV) co-infection, people who are awaiting or have received a liver transplant, people with clinically significant extra-hepatic manifestations and those with debilitating fatigue. Treatment should also be prioritised for people at increased risk for onward transmission of HCV, including people who are currently injecting drugs, gay and bisexual men with high-risk sexual practices and women who wish to get pregnant. The guidelines state that treatment is justified for people with moderate fibrosis (stage F2), and Pawlotsky suggested that some reason can usually be found to treat such patients, such as fatigue. People with absent or mild fibrosis (stage F0-F1) can defer treatment, but should be assessed regularly for disease progression and to discuss new treatment options that may become available or affordable. Treatment is not recommended, however, for people with limited life expectancy due to conditions unrelated to liver disease. Interferon-free direct-acting antiviral (DAA) regimens "are the best options when available," according to the guidelines, due to their virological efficacy, ease of use and good tolerability. This is the case for people with HIV and HCV co-infection and people with HCV mono-infection, and for people who do not have cirrhosis as well as people with compensated or decompensated cirrhosis. Pegylated interferon plus ribavirin, or triple therapy with interferon/ribavirin and the first-generation DAAs boceprevir (Victrelis) or telaprevir (Incivo or Incivek) remain acceptable only where none of the new options are available. "The message is you can use a suboptimal therapy if you have nothing else," Pawlotsky emphasised. "But the sooner you can get rid of it, the better." Ribavirin still has a role to play in helping prevent relapse in people with difficult-to-treat hepatitis C. People with cirrhosis and liver transplant recipients should include ribavirin in their interferon-free regimen if possible. For those who cannot use ribavirin due to intolerance or contraindications, treatment duration should be extended. When EASL issued its last set of guidelines at the 2014 International Liver Congress there were three DAAs available: the nucleotide HCV polymerase inhibitor sofosbuvir (Sovaldi), the HCV protease inhibitor simeprevir (Olysio) and the NS5A inhibitor daclatasvir (Daklizna). Since then, three more options have been approved: the sofosbuvir/ledipasvir coformulation (Harvoni), the paritaprevir/ritonavir/ombitasvir coformulation (Viekirax) and the polymerase inhibitor dasabuvir (Exviera); the latter two agents are approved as a single '3D' regimen in the US (Viekira Pak). The standard duration of interferon-free therapy is generally 12 weeks. Some people with genotype 1 and without cirrhosis can take sofosbuvir/ledipasvir for just 8 weeks without ribavirin. People with genotype 1 who have cirrhosis should add ribavirin or extend treatment to 24 weeks. Although HCV subtype 1a is considered harder to treat than 1b, treatment recommendations are generally similar. There are still "not many options" for people with genotypes 2 or 3, and there are few data on genotypes 5 and 6, Pawlotsky said. Across genotypes, only a few regimens are recommended for people with decompensated cirrhosis: sofosbuvir plus ribavirin (genotype 2 and 3), and sofosbuvir with either ledipasvir (genotypes 1, 4, 5, and 6) or daclatasvir (all genotypes). In addition to specific antiviral regimens, the guidelines also include recommendations on monitoring during treatment, managing side-effects and drug-drug interactions, improving adherence and options for re-treatment of non-responders. Re-treatment is largely dependent on what regimen a person received initially and whether they carry drug-resistant viral variants. For people starting treatment for the first time, Pawlotsky suggested it may be advantageous to "slightly over-treat" with first-line therapy – rather than trying to shorten treatment or reduce the number of drugs as much as possible – to avoid the need for re-treatment. While monitoring HCV viral load before, during and after treatment was a critical aspect of treatment with interferon-based therapy, "monitoring HCV RNA on therapy will not help you make decisions about treatment [with DAAs]," Pawlotsky stressed. "If it goes down fast, that's good, but it doesn’t predict a cure." Regarding HIV/HCV co-infection, studies have shown that people with co-infection and people with HCV mono-infection respond equally well to interferon-free therapy, and indications for treatment are therefore now "identical" save for taking into account drug-drug interactions with antiretroviral therapy, said panel member Puoti. With some 30 antiretrovirals available, "now it is possible to treat all patients with HIV [for hepatitis C] without changing their antiretroviral regimen," though in some cases dose adjustments may be indicated. "HIV specialists are used to managing drug-drug interactions," he added. Looking at people who are awaiting or have received a liver transplant, treatment recommendations are not as definitive, with several areas of remaining uncertainty. Treatment is generally indicated pre-transplant as it can prevent infection of the donor liver graft. But the optimal timing requires individual assessment, Pawlotsky said. In some cases, it may be best to give very sick patients a transplant right away, if available, and then start treatment once they have their new functional liver. While curing hepatitis C remains the primary goal, effective treatment could have the unfortunate effect of reducing a patient's CPT and MELD scores enough to lower their priority for transplantation, but not enough so that they no longer need one – a situation Jensen dubbed "MELD purgatory." The guidelines also contain sections on treating other special populations including people with HBV co-infection, people with chronic kidney disease and those undergoing kidney dialysis (the safety of sofosbuvir may be reduced in these patients), people with bleeding disorders, and active substance users and people on opioid substitution therapy. "HCV treatment must be considered for [people who inject drugs], provided they wish to receive treatment and are able and willing to maintain regular appointments," the guidelines state. "HCV treatment has been delivered successfully to drug users through various clinical models, including within general hospital liver disease and viral hepatitis clinics, drug detoxification clinics, opioid substitution therapy clinics, prisons, and community-based clinics." While DAA trials have usually excluded people who are currently using drugs, many have included participants on opioid substitution therapy, and drug-drug interaction studies to date have not found clinically important interactions with methadone or buprenorphine. In addition to the hepatitis C treatment guidelines, EASL, in conjunction with the Asociacion Latinoamericana para el Estudio del Higado (Latin American Association for the Study of the Liver), has published joint clinical practice guidelines on non-invasive tests for the evaluation of liver disease severity and prognosis. These recommendations are also published online in the Journal of Hepatology and available on the EASL website. Traditionally, liver biopsy has been the gold standard for assessing liver injury, and staging was important for deciding which individuals to treat for hepatitis C. Today, non-invasive methods using various biomarkers and imaging techniques including transient elastography (FibroScan) are more widely used. "Measurement of liver stiffness is becoming the standard, including in the US where it was approved one and a half years ago," Castera said. However, as the hepatitis C treatment guidelines state, "Both liver stiffness measurement and biomarkers perform well in the identification of cirrhosis or no fibrosis, but they perform less well in resolving intermediate degrees of fibrosis." When the standard of care was interferon-based therapy – which was difficult to tolerate, lasted 6 to 12 months and only cured about half of patients – treatment was usually limited to people with progressive liver disease. Given the effectiveness and ease of interferon-free DAA therapy, staging may be less important – as many experts think everyone with HCV should be eligible for treatment – but some insurers and government payers are using it to restrict treatment access due to the high cost of the new drugs. Asked to compare the EASL and AASLD treatment guidelines, Jensen said he was impressed by how similar they are. "Their power is based on the fact that the guidelines are very consistent," he said. "The differences point out areas where there needs to be further study." These remaining questions include the best regimens for people with decompensated cirrhosis – especially those with more severe CPT class C – the optimal timing of treatment pre- or post-transplant, better options for people with HCV genotype 3, and more data on genotypes 5 and 6, given that hepatitis C is a worldwide problem. Finally, participants discussed what has become perhaps the most pressing issue regarding hepatitis C treatment: expanding access to everyone with HCV in the face of limited resources. "The basic science has been done," stressed Pawlotsky. "Now we're doing public health." "Access is the biggest issue now," Aghemo concurred. "Most people who are HCV-infected don't know it – it's time to increase the screening process," he continued. "But still the biggest issue is pricing of drugs, which is excessive. In most European countries treatment is limited to advanced patients. In the European Union we could negotiate lower prices if we worked as a group instead of on the national level." Jensen cautioned that shortening treatment duration "can lower the price tag, but comes at the price of risk of more relapses. If there's added risk of relapse – even if it's only 5% – it may outweigh the savings of shorter treatment." Studies have shown that deferring treatment leads to detrimental outcomes, "but cost is influencing policy decisions," Dusheiko concluded. "There will be no solution to that until there's more competition in the marketplace and drug costs come down in 2 to 5 years." Pawlotsky JM et al. (European Association for the Study of the Liver) EASL recommendations on treatment of hepatitis C 2015. Journal of Hepatology online edition, 2015. Castera L et al. (European Association for the Study of the Liver and Asociacion Latinoamericana para el Estudio del Higado) EASL-ALEH clinical practice guidelines: non-invasive tests for evaluation of liver disease severity and prognosis. Journal of Hepatology online edition, 2015.